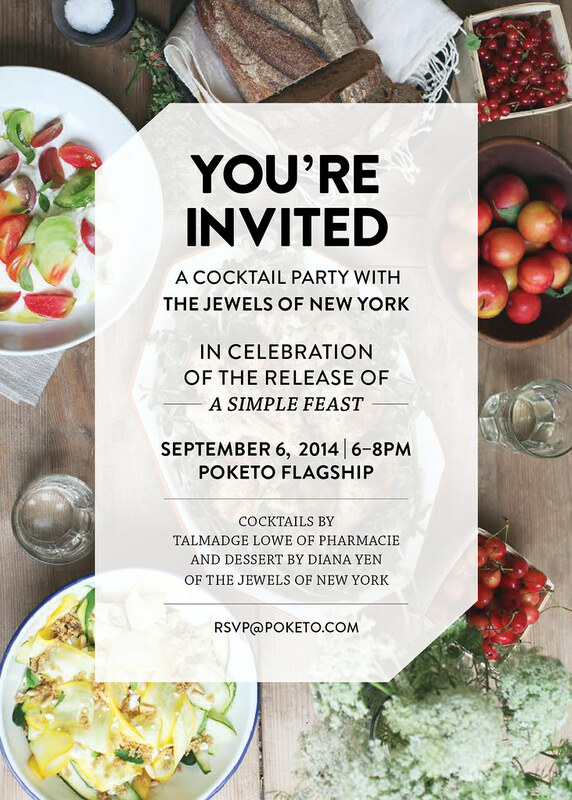 Poketo is joining forces with The Jewels of New York to host a cocktail party in celebration of the release of the new cookbook A Simple Feast. Talmadge Lowe of Pharmacie will be shaking up The Queen’s English cocktails (Vodka / Lime / Cucumber / Celery Seed Shrub) and Diana Yen of The Jewels of New York will be serving a seasonal dessert pairing. Diana’s Angora rabbit, Cleo the Bunny, will be making a special guest appearance—in full cocktail attire, of course. Come eat, drink and toast to the end of summer with us!